Soon Jake learns that the horrific accident is being investigated as a possible homicide, and it’s not the only case. Detective Inspector Cordiline of the London Met hints at spontaneous human combustion, but as far as Jake knows, SHC doesn’t exist. When Mari looks into a group called Birthright, he finds a connection to the victims of the fires and Jake risks himself to go undercover at the shadowy organization. The race is on to determine the truth before Jake becomes the next target. 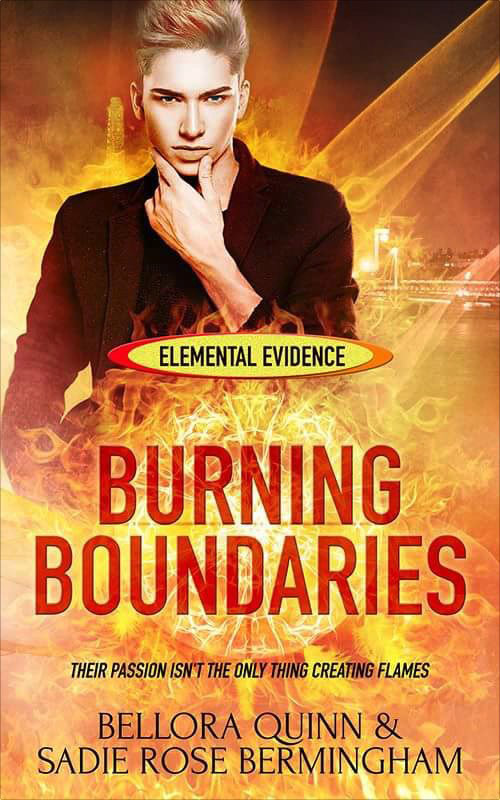 Elemental Evidence Series: Former Detective Jake Chivis is a Fire Elemental who uses psychometry to see the past. Doctor Ilmarinen Gale is an Air Elemental, a human/cybernetic interface, able to infiltrate even the toughest information systems. Together they find out just how potent a combination Fire and Air can be when it comes to solving crimes. Amid murder, conspiracy and a world that views them with suspicion, and sometimes contempt, Jake and Mari circumvent the conventional. While the police aren’t always appreciative of their methods they can’t deny the results. When they aren’t busy consulting for the police, figuring one another out is their next big mystery. One that proves as frustrating as it is passionate. Between hunting killers and avoiding competing government agencies that want the two of them working on their side, they just might have enough time for love. Was that flirting? Was he flirting with the guy? Jake tried to rein those thoughts in but he couldn’t help it. Mari had a habit of flirting, but it had never bugged Jake before. Jesus, they’d managed to go to one bar for an hour and already he was devolving into Neanderthal territory. He realized something else. It had never really bothered him when he and Alex had gone out and his ex had spent all night coming on to strangers. Then again, he’d known Alex was doing it to get a rise out of him. That was not Mari’s way, at all. “You want another drink?” Jake asked, by way of keeping himself from hauling Mari out of there and grilling him about whether he wanted to sleep with Mr. Whips and Tattoos. They had to step to one side as a sweating, agitated-looking guy pushed by them on the stairs in an obvious hurry to get down to the basement for some chastisement. Though he looked chastised enough already, in Jake’s opinion. Jake snapped his mouth closed then pushed a hand through his hair and let out a sigh of his own. He had always pitied guys that acted like possessive jerks and here he was being as transparent as glass, all but snarling at anyone who got too close to Mari. “I’m sorry. I was aiming not to be obvious. I’ll try and refrain from clubbing you over the head and dragging you out by the hair.” He managed a sheepish grin. “In that case, it would be my pleasure to have another drink with you, Chivis.” Mari chuckled, slipping a hand around the nape of his neck and towing him in for a brief, firm kiss. They made their way back up into the bar and as they were weaving their way through the crowd, Jake heard someone shout, then screaming coming from the direction of the basement. Jake noticed the smell just as Mari was saying it, and turned his head. A curl of pale smoke was winding up from the basement stairway, not thick but noticeable. Jake gave him a push toward the front exit then shoved through the crowd, trying to get to the stairs. Bellora Quinn: Originally hailing from Detroit Michigan, Bellora now resides on the sunny Gulf Coast of Florida where a herd of Dachshunds keeps her entertained. She got her start in writing at the dawn of the internet when she discovered PbEMs (Play by email) and found a passion for collaborative writing and steamy hot erotica. Soap Opera like blogs soon followed and eventually full novels. The majority of her stories are in the M/M genre with urban fantasy or paranormal settings.